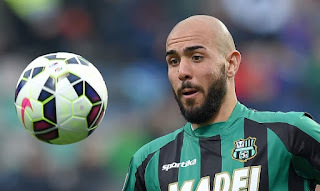 Juventus sign Simone Zaza from Sassuolo Serie A Champions Juventus have officially announced the signing of striker Simone Zaza from Sassuolo, according to their official website. Serie A Champions Juventus have officially announced the signing of striker Simone Zaza from Sassuolo, according to their official website. Juventus boss Massimiliano Allegri who recently sealed a new one year deal has strengthen his attack earlier today with the signing of Simone Zaza. The Italian outfit have now sealed three strikers so far this summer, Paulo Dybala from Parma, Mario Mandzukic from Atletico Madrid and Zaza. However, the Champions League runner ups have also lost their star player Carlos Tevez who joined his childhood club Boca Juniors recently. Tevez left after playing two successful seasons in Turin. Zaza who scored 11 goals for the Serie A side last term has sealed a five year deal. The fee for the Italian attacker is reportedly around £12.75 million which will be paid in a course of three years. The 24-year-old will have to struggle in Turin to get the opportunities as they already have a fine attacking line. He will be fighting the two new strikers Paulo Dybala and Mario Mandzukic. Meanwhile, Italian midfielder Andrea Pirlo has also left the Champions for the Major Soccer League side New York City. But the Italian have already sealed the deal of German midfielder Sami Khedira from La Liga giants Real Madrid.